Kawasaki Kisen Kaisha, Ltd. (K Line) achieved 13.6% reduction in CO2 emissions*1 in 2015 against 2011 level, as a result of deployment of larger vessels, proactive initiatives for introducing advanced energy-saving technologies including electronically controlled engines, as well as slow steaming being continuously pursued through close cooperation at sea and on land with ship owners, vessels and ship management companies. Therefore, the K Line successfully accomplished ahead of schedule the CO2 emission reductions target by 10% for 2019 against 2011 level, which is one of the Company’s interim milestones by 2019, the 100th anniversary year of its foundation, under “K” Line Environmental Vision 2050 ～Securing Blue Seas for Tomorrow～*2 as a long-term objective toward 2050 established in March 2015. In light of this achievement, “K” Line set a new CO2 Emission reduction by 25% for 2030 against 2011 level in the process of CO2 emission by half for 2050 under the Vision. Towards the new target, K Line is pursuing further CO2 emission reductions through both hardware side such as deployment of energy-saving vessels, continued review on energy diversification including LNG-fueled vessels as well as adoption of energy-saving technologies to be retrofitted on existing vessels, and software side to enhance efficient operation by use of big data obtained timely from vessels and the operational management for ballast navigation and anchorage under energy management system which is now being introduced for thorough marine energy saving. 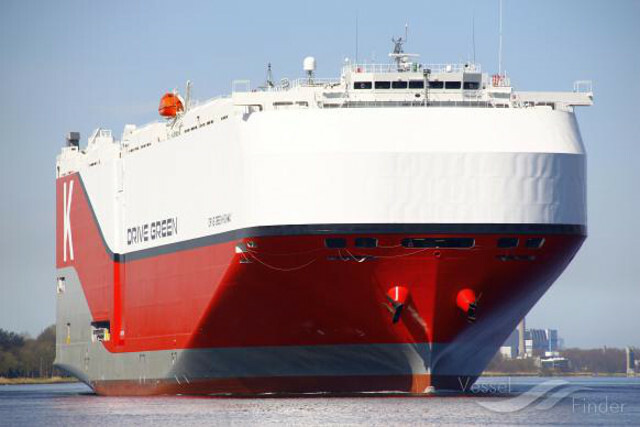 As a world–leading marine transport operator, “K” Line continues to aim at providing more environmentally and efficient transportation services for more people all over the world. *1 Per ton-mile basis is an index for transporting one ton of cargo one nautical mile (1,852 meters).